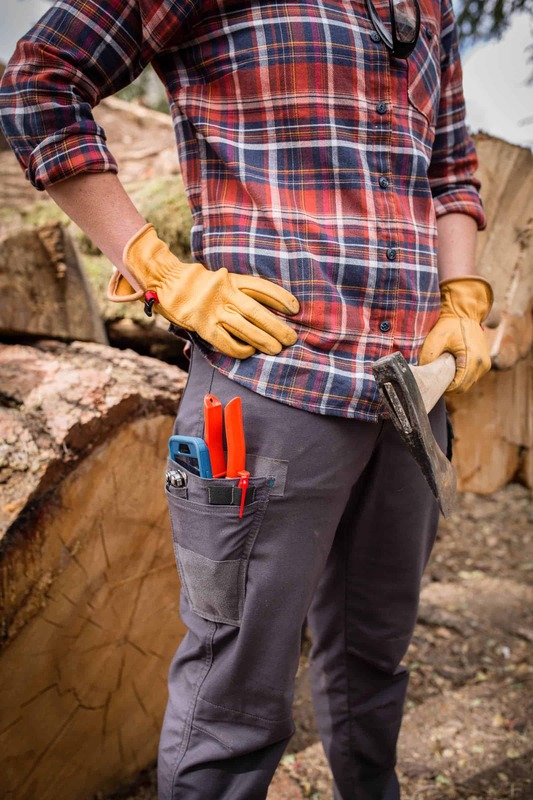 Though women have moved into agriculture and the trades, work clothing remains a man’s world, says an Oregon entrepreneur. She’s attempting to start a new apparel line that provides working women with rugged clothing that fits. For men working in trades or agriculture, dressing for work each day is simple. Throw on a pair of sturdy jeans, a long-sleeved shirt, maybe some steel-toed boots, check to be sure the hard hat and gloves and eye-protection are stowed in the truck if needed. Good to go. But women in these occupations have a harder time finding a pair of pants that are sturdy but cut for wider hips and thighs. Women’s work boots or jackets are often just smaller versions of those designed for men, and the proportions are not quite right for many. Shirt tails are too short to stay tucked in, exposing bare skin when a woman bends or stretches. And if a woman doesn’t care for the color pink or for flowery prints, the pickings for work gloves can be slim. 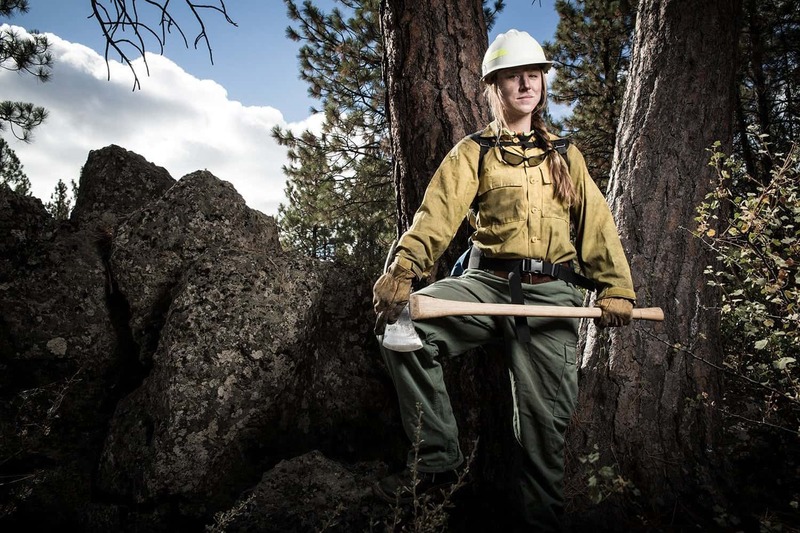 That’s why Stacey Gose of Corvallis, Oregon, has launched a line of women’s work clothing that addresses what she calls the problem in women’s workwear. Her company is called TougHER, and she’s funding the manufacturing through a crowdsourcing campaign, one product offering at a time. Gose says about 30 percent of trade and agriculture jobs are filled by women, but that the amount of women’s workwear on the sales floor doesn’t come close to matching that proportion. “Women work across trade groups, including agriculture, construction, utilities, mining, farming, ranching and other blue-collar work,” she said. Many people in these occupations are required to wear “uniform compliant” apparel, and it is up to them to find it. Gose explains that “women work hard to earn a wage but still have to be set up for gear.” That might include flame resistance or protection around heavy machinery. Women have enough barriers to entering the trades, ranging from a shortage of role models to availability of training opportunities. “Finding the right gear shouldn’t be another barrier,” she said. Gose sees access to appropriate work clothes as not only a matter of comfort and safety, but as a social justice issue. If a woman can’t find or afford the proper clothing for a job, she might settle for something less with lower pay. Part of Gose’s inspiration comes from her early years on a northcentral Iowa farm. 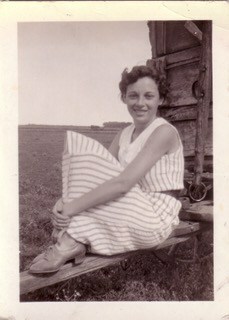 Although her parents left the area for opportunities in California when she was a small child, they continued to visit the family farm each year. “I was able to go back each summer growing up, to do things like spray beans and help with show cows. I still love being outdoors and the smell of soil,” Gose said. My experience with women’s work clothes confirms Gose’s analysis that there’s little to choose from that’s both comfortable and durable. To get a broader perspective, I asked a couple of friends with firsthand knowledge on the subject to weigh in. After all the effort Meyer went through to be prepared for work, she noticed barriers that went beyond workwear. “The other side I got from other people was rather negative, suggesting that my work wasn’t appropriate in my condition, I was putting myself and my child in harm.” She powered through that, however, and continues to do the work she wants to do. Gose found similar findings when she conducted her research about women’s work apparel for her MBA project. She identified various trade organizations such as farming, construction and law enforcement with a significant number of female members. She surveyed or interviewed 400 of these women. She asked about demands in their line of work, whether they used specially designed work clothes, whether they wore men’s or women’s styles for work, and what they would make for a better and more comfortable fit if they were to design them themselves. Gose found that 98 percent of the women she surveyed bought at least some men’s wear because there were either no options for women or those options were of lower quality. Gose hopes her approach will help her overcome the reality that the apparel business is one of the most capital-intensive ventures to start. Usually, materials are needed in advance of taking orders, so that stores or warehouses can be stocked and items available for purchase. Instead, Gose is gearing up for a monthlong Kickstarter campaign for her work pant in December. At the end of that period she will have the capital to fill orders for those campaign purchasers. She’ll also have a bit of market research about what sizes and other features women seek. Julianne Couch is the author of The Small-Town Midwest: Resilience and Hope in the Twenty-first Century and the novel Along the Sylvan Trail. She lives and gardens in Bellevue, Iowa.